Born in Concarneau in 1844, Guillou received his training in the ateliers of the great Academic artists Alexander Cabanel and William A. Bouguereau and it was from these artists that his style and choice of subject matter were developed. Specializing in genre scenes, in his native area of Concarneau, his works often depict pretty young women in everyday, and at times humorous, situations. Whether on a fishing boat or in the lush Normandy landscape, his beautifully rendered figures display his academic training. 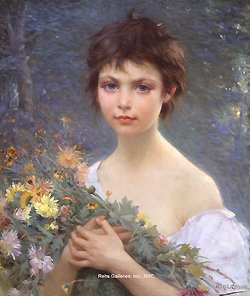 Guillou exhibited many works at the Salon in Paris during his lifetime and received a third class medal at the 1877 exhibition and a second class medal at the 1881 exhibit. He also exhibited works at both the 1889 and 1900 Universal Exhibitions where he received silver medals.